Mini muffins are loads of fun for little kids, and a great snack to pack into a lunchbox. These ones were inspired by a recipe shared with me from a friend and originally were a loaf, but we swapped things around and made them teeny muffins instead. Sweetened with maple syrup and spiced up with cinnamon, ginger and nutmeg, they are a wonderful snack. Puree up bits of roasted butternut squash to add in and the kids will never know the wonderful veggie goodness that they are getting. Try slathering them with a bit of cream cheese for a tasty afternoon tea! 1. Pre-heat the oven to 350°F. Spray a mini muffin tin with non-stick spray. Set aside. 2. In a medium sized bowl, sift together the flour, baking powder, baking soda, salt, cinnamon, ginger, and nutmeg. Set aside. 3. In the bowl of an electric mixer, cream the butter and sugar together until fluffy. Scrape down the sides of the bowl and add the egg and maple syrup. Beat until well combined. Stir in the butternut squash puree. 4. Fold the flour mixture into the butter mixture until just combined. Spoon into the prepared mini muffin tin, filling the cups until about 2/3 full. Drizzle a tiny bit of butter over each and sprinkle with a bit of sugar, if desired. 5. Bake for 15-20 minutes until browned and a toothpick inserted into the center comes out clean. 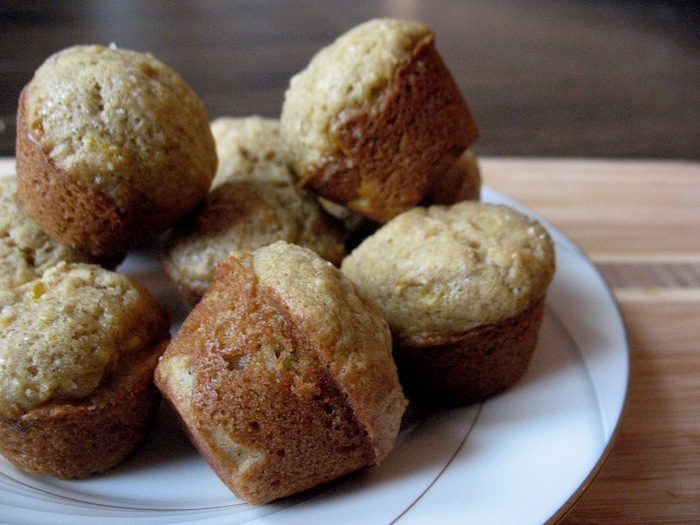 Muffins will keep for a few days on the counter in an airtight container, or freeze them for up to 2 weeks.